"Aptly titled third album from the Nashville-based duo comprising Fran Jackson (lead vocals, acoustic guitar) and Jay Studdard (lead vocals, acoustic guitar) supported by Bobby Alexander (electric guitars), Joe Bidewell (keyboards, harmonica), Daryl Johnson (drums), and Kevin Knapp (bass) , this is quality southern music embracing country, blues, folk, and everything in-between. "This Time Tomorrow" is a powerful-blues inflected song with stunning electric guitar and heart-stopping vocals. They go for a laid-back, almost acoustic approach for the gentler "Just Another Man" with atmospheric guitar hovering above and behind Studdard's sensitive vocal. Jackson steps forward to take the lead on "You Win" an emotional warning to a loved one as the relationship disintegrates. This is not only great songwriting, but inventive musical arrangements, quality musicianship, and heartfelt vocal work that evokes real heart and soul and connects in a way that few acts are able to. Highly recommended." " "down south" is a tingly album by neo-south duo bedhed and blondy. there are all kinds of sounds here, but i hear a dance off in the combat zone. the album is full of fury and musical imagination." "It's tempting to compare any male-female duo possessing a down home sensibility to Johnny and June, Gram and Emmylou, Porter and Dolly etc., but to their credit, Bedhed and Blondy, AKA Jay Studdard and Fran Jackson, make it fairly clear they don't want to be lumped in with anyone else. Theirs is a sassy sound that's bred with a cool confidence that's readily apparent on every song herein. Jackson's vocals purvey a swampy sensuous style that quickly comes across in early entries like "Merry Go Round (Bummer)" and "This Time Tomorrow," but when the duo sing in sync on a song such as "Hearts," the back and forth give and take between the two conveys the ideal synergy. Down South is an apt title, given the music's smokey southern sway and the pair's naturally unhurried approach. A sleeper of a record, it's one with the potential to gain added momentum even as it discreetly reveals its charms." "...the album is rich with blues, altcountry, Southern rock, and Folk arrangements. The album starts off very strong with "Loving You". A typical example of how Americana needs to sound. The title track is perhaps the most bluesy number. Swirling organ tones and greasy guitar riffs immediately provide a stunning desert......Down South is really a great Americana release....with amazing vocals and a beautifully harmonic sound." "I couldn't help but think of folk-rock duo Richard and Linda Thompson's final album, Shoot Out The Lights, when listening to this one. There's a similar vocal dynamic and a similar feel to a lot of the songs, though they're occasionally a little farther toward the country end of the spectrum. Full of impressive guitar work and dark overtones, Down South definitely deserves a listen." "Americana duo Bedhed and Blondy (aka Jay Studdard and Fran Jackson) debuted with an impressive acoustic album "Somewhere in Memphis" in 2010 and took things to the next level last year with an even better sophmore effort "Nuthin'". They've dug deeper into their Southern roots for the aptly titled third release "Down South".....Bedhed and Blondy knock it out of the park on "Loving You," "Merry Go Round,"and "This Time Tomorrow,".....With three winning efforts in as many years, Bedhed and Blondy are fast becoming one of my favorites. "With an eyebrow-raising cover, Bedhed and Blondy aim to "buck" the music industry trend to box artists into a particular genre.....They call it "Neo South", it's good, and that's all you need to know." 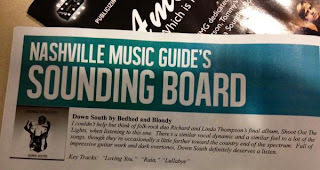 "...Down South takes the duet back to their deep southern roots and the outcome is a disc that is beautifully harmonious and chock full of southern musical hospitality...All of the nine tunes on Down South are great...The opening cut, Loving You...is beautifully written, performed, and recorded. This song is worthy of national radio play as well as some close attention by the country cable TV networks. 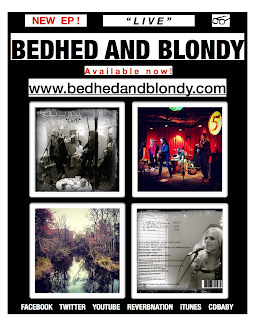 Yeah, it's that good...If you love great, smooth, easy listening, southern grown music sung from the soul, then you will definitely want to get your copy of Down South by Bedhed and Blondy. You're going to love it." "...Vocals and lead guitar are recorded with minimal effects so they sound like they're pushing up against the walls of your brain (I guess that would be your skull). 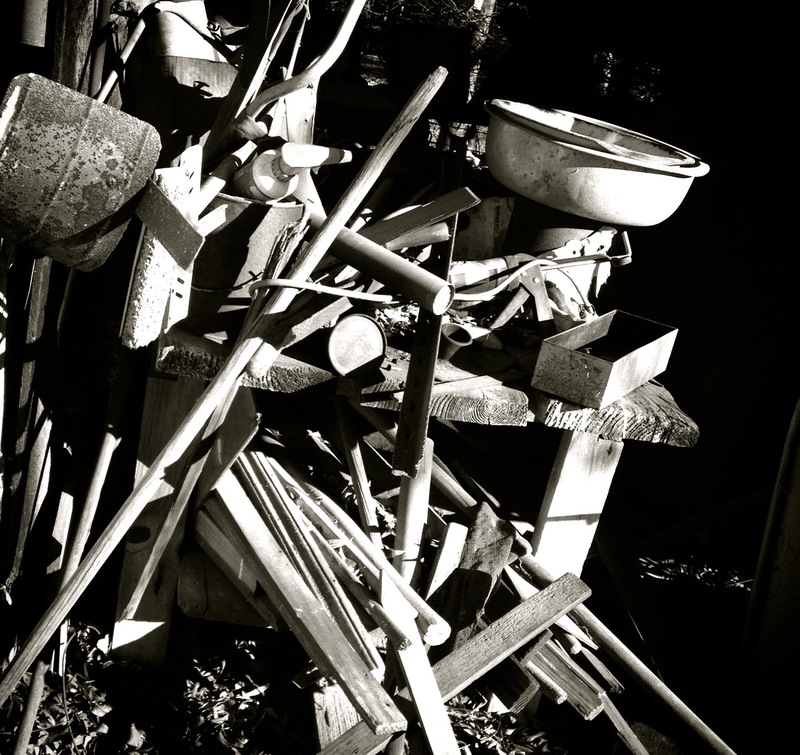 Smartly constructed lyrics and a softspoken, adult musical sense add up to a bunch of groovy alt-Country/Americana.....favorite tracks are the tense, slow, minor-key "Just Another Man," the Fleetwood Mac-like "This Time Tomorrow" with Joe Bidewell's warbling organ, and that opening waltz "Loving You" where jackson's vocals ride atop the tide of instruments like a crisp wind over dark water." 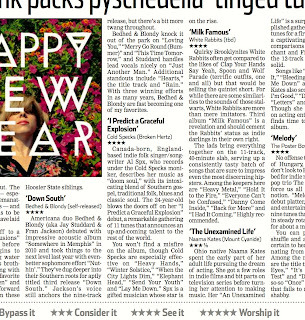 Below are reviews from our 2011 release "Nuthin'"
"...the band unleashed this, their first electrified release, this past winter; it's a brief (eight song) but pointed statement with no filler or fluff.....Strong songwriting with literate lyrics and superior vocals makes this one of the top independent Americana releases of the year so far." ".....Bedhed and Blondy hit some real high notes with Nuthin'..., a distinctive collection of songs that screams for your attention. Jay Studdard has an easy-going vocal style that's the perfect foil for Fran Jackson's sensually acerbic alto. The songwriting on Nuthin'... ranges from above average to outstanding, and is of a general quality that suggests long term success is a real possibility for the band. This is one of those albums that won't leave you alone. Don't be surprised if you keep hitting play again and again, or finally give up and put the whole thing on repeat. Bedhed and Blondy will do that to you. "From opener "Grab Hold" until the closing notes on "Georgia Clay" the sound is great and comes with a wonderful atmosphere.....I would rather add this band to the Alt. country section! The music is much more active and interesting than the majority of the Americana outfits out there today. A collection of memorable songs, a variety of influences, and a great chemistry between the band members is without a doubt one of the best formula's for a band......"
"....this baby band, born only last February 2010, has now combined forces with a group of drop-dead talented musicians....Bedhed is Jay Studdard, who has a hand in writing all eight songs on their sophomore release "Nuthin'..." Joined in the production booth by Blondy, aka Fran Jackson, a strong female vocalist out of Alabama... they've created an acoustic, little-left-of-mainstream honey of a record." "Their country-leaning full-length debut is a delight from beginning to end, as Studdard and Jackson seamlessly trade vocals throughout the course of the eight-track release. Opener "Grab Hold" sets the tone for "Nuthin'..." and B&B&S additionally hit the mark on personal favorites "Hard Times and Headaches", "I've Been Thinkin'", "Poison Whiskey", and "Georgia Clay". About the only thing here that doesn't work is the rather unwieldy band name. Everything else is magical. "This is a great EP chalked full of 8 songs that grab a hold of you and never let go from the beginning. Well worth checking out for you music aficionados out there that are looking for solid songwriting that may be a little left of the mainstream dial bit still close enough to make this listenable without being too far away from it." "......Their sound is a mixture of a lot of different styles. There is a folk sound. You will also hear a definite blues influence and more than a slight bit of Southern Rock in the music.......I often praise a band and say that they are headed toward great things. But every once and a while I find a band that I feel is definitely on their way up. This band is definitely on their way up. 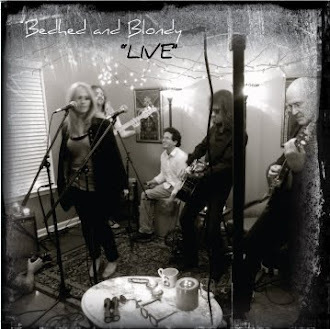 Blondy has fantastic vocals, Bedhed's are just about as good, and the band itself puts forth terrific music...."
"This is a great CD, eight original tracks filled with awesome tunes, outstanding harmonies by Jay Studdard and Fran Jackson... this talent makes this band one of the best sounding Americana-Blues Bands that I have heard in a while...."
"....Bedhed and Blondy (a.k.a. Jay Studdard and Fran Jackson) who's close vocal harmonies (and rhythm guitar work) are seamless, tight and tasty... I love the Americana/Folk rock sound that is wall to wall on this all too short release. In short, the solid songwriting from both Studdard and Jackson make the 8 tracks shine and gleam with a warmth courtesy of their integrity, talent, and quiet intensity that is palpable....I cannot recommend this CD or group strongly enough! Check 'em out, you'll be glad you did! "Music is perhaps best when its essence reveals a depth of soul, and simplicity. Nuthin,' a delightful release from Bedhed & Blondy, reflects this notion, as its sweetness and swagger render songs that are instantly memorable. Sparse instrumentation underscores this release, allowing the duo's voices, and songs to be at the forefront of a band that echoes newgrass, folk, and blues. 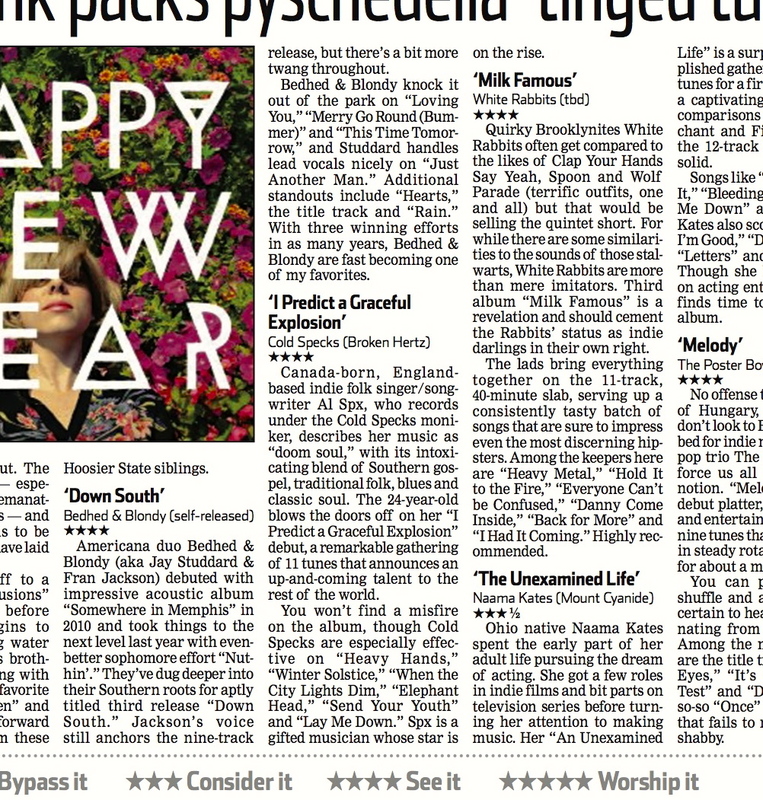 An endearing record, Nuthin,' from Bedhead & Blondy, is heartfelt, and sincere... The lp is a whiskey-bent, easy river ride, with harmonies that twist and turn. Reassuring with its musical gems--eight songs later, you'll have forgotten that you forgot the whiskey." "Fran Jackson hails from Alabama. She has an authentic blues feeling emoting and elusive feel to her vocals. Fran accompanied herself with guitar with a slap rhythm style starting with a song called " Chained." There's an ability to hit the higher notes then fade them out with that bit of edge that makes her stand out.. Fran is also a part of a duo called Bedhed and Blondy so she gigs as a solo artist and part of a duo."